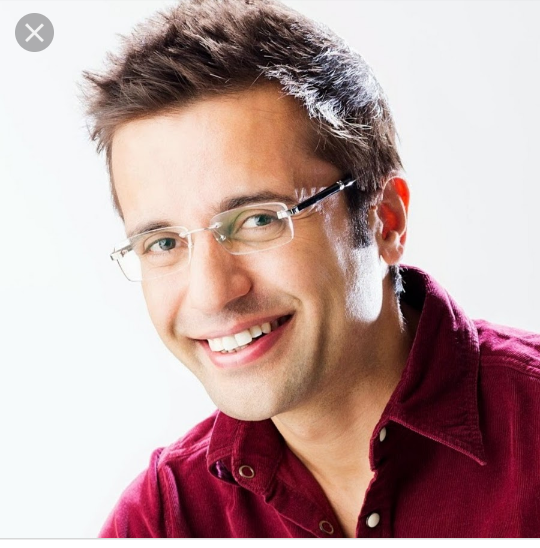 Lionel Messi is an Argentinian footballer widely regarded as one of the greatest players of the modern generation. He plays for FC Barcelona and the Argentina national team. He has won FIFA world player of the year four times (a record already). He has often been described as Diego Maradona’s successor because of his prolific goal scoring record and ability to dribble past opponents. Lionel Messi was born, 24 June 1987, in Rosario, Argentina to a working-class family. His father was a factory steel worker, and his mother a cleaner. He began playing from an early age, and his talent was soon apparent. However, at the age of 11, Messi was diagnosed with growth hormone deficiency (GHD). This was a condition that stunted growth and required expensive medical treatment, including the use of the drug Human growth hormone. His local club, River Plate were interested in signing Messi but didn’t want to pay for his medical treatment. However, Messi was given a trial with Barcelona, and coach Carles Rexach was impressed – offering Messi a contract (written on a paper napkin!) which included paying for Messi’s treatment in Spain. Messi moved to Barcelona with his father and became part of the prestigious FC Barcelona youth academy. 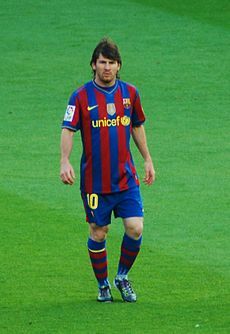 Messi progressed through the ranks and was given his first appearance in the 2004/05 season becoming the youngest player to score a league goal. In 2006, Messi was part of the double winning team which won both La Liga (Spanish League) and Champions League. By next season, (2006-07) aged just 20, Messi was the first choice striker and an essential part of the Barcelona team – scoring 14 goals in 26 league games. In the 2009-10 season, Messi scored 47 goals in all competitions, equalling Ronaldo’s record total for Barcelona. As the seasons have progressed, Messi kept improving and breaking his own records. In the calendar year of 2012, he broke the all-time world record for most goals scored in a calendar year. His final total of goals in 2012 was 91 – beating the previous record of 85 by German Gerd Muller, and Pele’s milestone of 75 in 1958. At the start of 2013, in club football, Messi has scored 292 goals from a total of 359 appearances, and in international football, 31 goals from 76 appearances. At the end of 2012, Messi turned down a very lucrative offer to play for an unnamed Russian side. It would have given Messi a salary of €20 million a year and made Messi the most expensive player in the world (Barcelona would have been paid €250 million). He turned down the offer because he was unsure if he would be playing in major European championships and the difficulties in moving to Russia. Instead, he signed a contract with Barcelona until the end of 2018. When asked about moving to the English Premier League, Messi revealed his sense of commitment to Barcelona. Because Messi was brought up in Spain, since he was 11 years old, he has Spanish nationality. In 2004, he was offered the chance to play for Spain’s Under 20 side, but Messi decided to play for Argentina, the country of his birth. He led Argentina to victory in the 2005 FIFA Youth Championship. Messi made his full international debut in August 2005, during a friendly against Hungary. In his first game, Messi was sent off for allegedly elbowing a player. The decision was contentious and not in keeping with Messi’s style of play which is generally clean and in the spirit of fair play; he has very rarely been accused of diving. In 2006, he participated in the World Cup, becoming Argentina’s youngest player to play in the world cup. Argentina were eliminated in the quarter-finals. In 2008, he won an Olympic gold medal for Argentina in football at the Beijing Olympics. Initially, Barcelona had not allowed him permission to play, but new coach Pep Guardiola allowed him time off. In the 2010 World Cup, Messi wore the number 10 shirt and played well to help Argentina reach the quarter-finals, but Messi struggled to score, and Argentina disappointingly lost 4-0 to Germany in the quarter-final. Messi has admitted he is desperate to play in a world cup final. Success for Messi in the World Cup would be the last test of greatness. Pele, by contrast, was part of Brazil’s three times winning World Cup side ’58, ’62 and ’70. Messi has often been compared to prolific Real Madrid goalscorer Christiano Ronaldo, but both have been keen to downplay the rivalry. By any standards, Messi’s goal scoring record is exceptional. By February 2013, he has scored 301 goals in 365 official matches for Barcelona FC. In 2012/13, Messi set an all-time world record of scoring in 21 consecutive games (33 goals from 21 games)He holds the Guinness World Record for most goals in a calendar year – 86 goals during 2012.He is the only player to score in four consecutive Champions League campaigns.As of February 2014, Messi has scored 343 club goals out of 434 appearances (including Barcelona B team)His international record for Argentina is 37 goals from 83 appearances. Olympic Gold Medal: 2008FIFA U-20 World Cup: 20052006 World Cup – QF2010 World Cup – QF2014 World Cup – Runners-up. Messi has frequently been the target of other football clubs with big transfer budgets, but he has remained loyal to Barcelona FC. He is one of the highest paid footballers in the world. His base salary is estimated at €16 million net a year, until 2018. His net wealth is estimated at €110m. Messi acts as an ambassador for Unicef, and also runs his own charitable foundation – supporting access to education and sport for children. Because of his own expensive medical treatment, he has also helped Argentinian hospitals with paying for similar treatment to his own. Many commentators have stated that Lionel Messi has performed at his best in all competitions, except the World Cup. In both the 2006 and 2010 World Cup, Argentina were knocked out in the quarter-finals, with Messi not at his best.